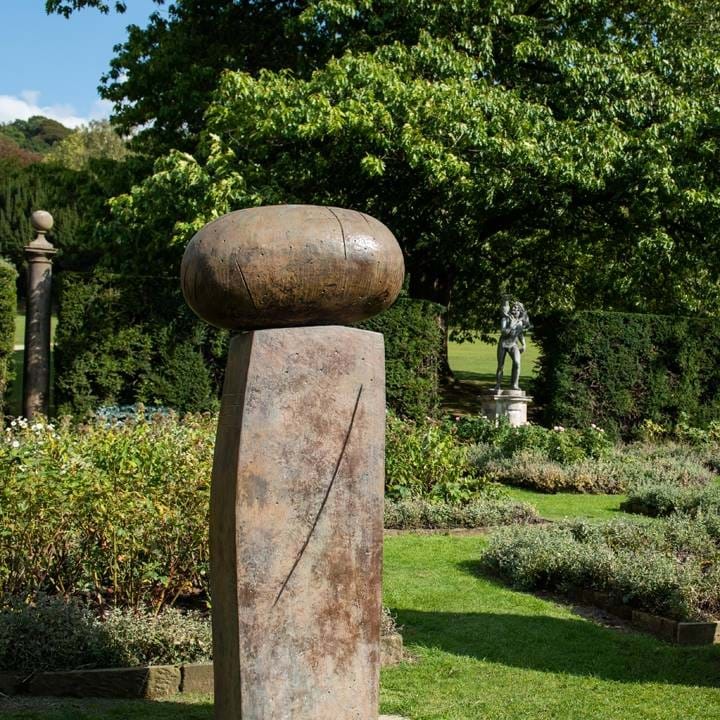 Celebrate sculpture at Chatsworth with us this autumn in the garden. 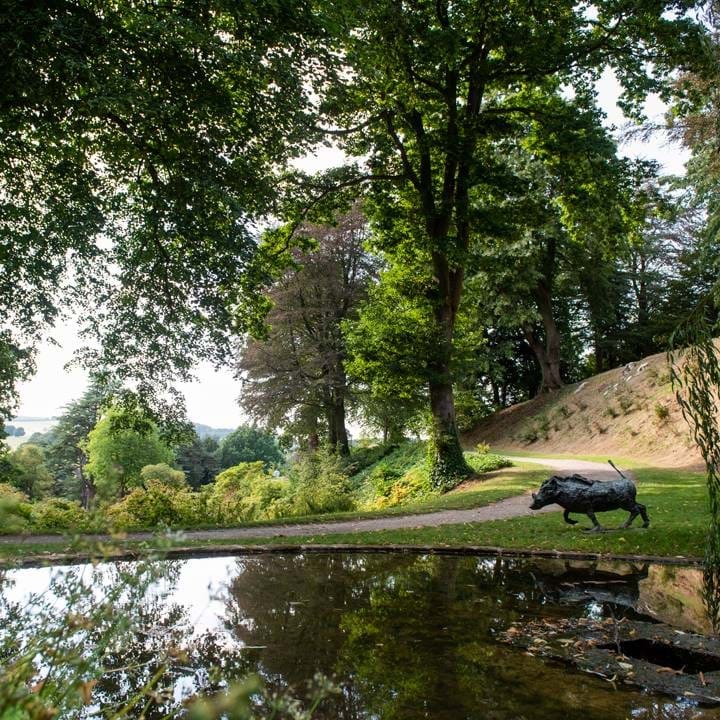 Join us as we shine a spotlight on art and nature through the creation of ‘viewpoints’; points of interest on the Duke and Duchess’ favourite walks that may take you to new corners of the garden or offer familiar favourites from a new perspective. Our existing sculpture collection, featuring many of the leading lights of post-war sculpture such as Antony Gormley, Elisabeth Frink, Allen Jones, Angela Conner, Michael Craig-Martin, Nic Fiddian-Green and Barry Flanagan including pieces rarely seen in public, is centre stage and positioned in response to the landscape; the garden being a sculpture itself having been shaped, built, planted and hewn from the Derbyshire landscape. As part of the exhibition our 2018 artist-in-residence, Linder Sterling, created a temporary installation Bower of Bliss in response to Queen Mary's Bower in the park. 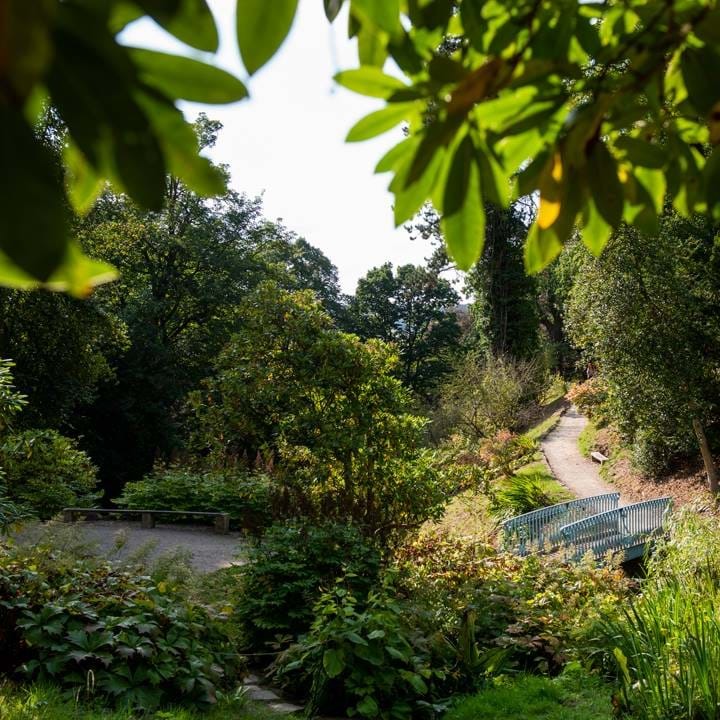 Use our digital map as a springboard for exploring a few of the viewpoints from afar and use our specially created way finder while in the garden to find your own, alternative view. We encourage you to enjoy a more expansive vista, share stories on the curious and the not-so-obvious; the sounds, the scents, the natural and the manmade; while celebrating sculpture in all its forms. 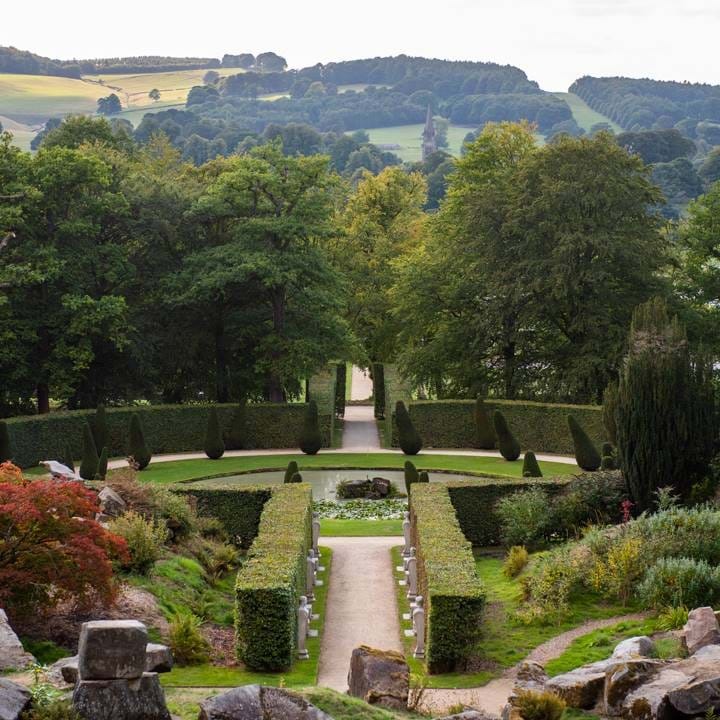 Share your favourite view on social #ChatsworthOutdoors. The Broad Walk runs from north to south, with Flora in the north and the so-called ‘Blanche’s Vase’ to the south. Inscribed in her memory, Blanche Cavendish, Countess of Burlington was just 29 when she died in 1840. Beloved niece of the 6th Duke of Devonshire, and married to the future 7th Duke, Blanche was mother to five children. 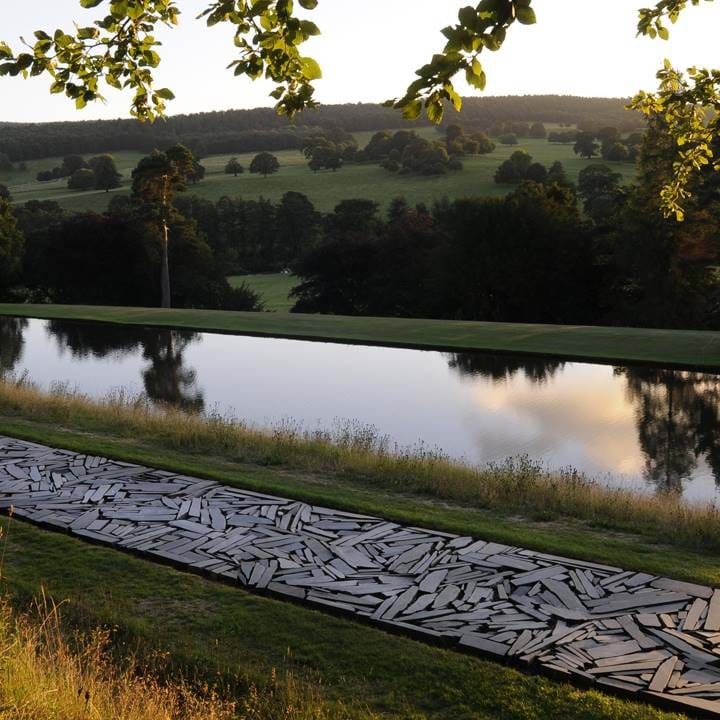 Closer west, Cornwall Slate Line by Richard Long travels along the Canal Pond. To the west – rolling hills, clumps of trees, the river, the bridge were all shaped by hand. 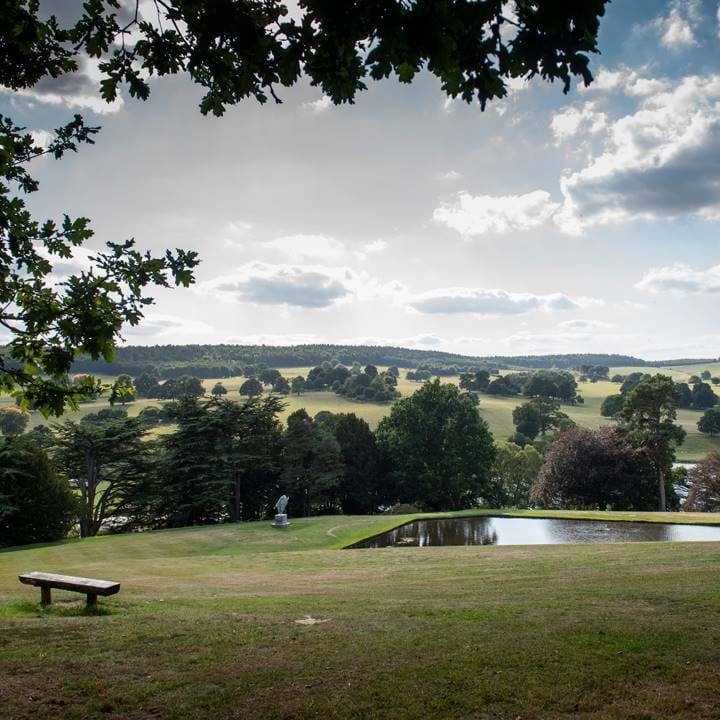 The landscape designed and sculpted to mimic nature by Lancelot ‘Capability’ Brown. A Greek sculpture of the horse belonging to moon goddess Selene inspired the career of sculptor Nic Fiddian-Green. Selene was in love with Endymion who sleeps in our Sculpture Gallery, bathed in her light. 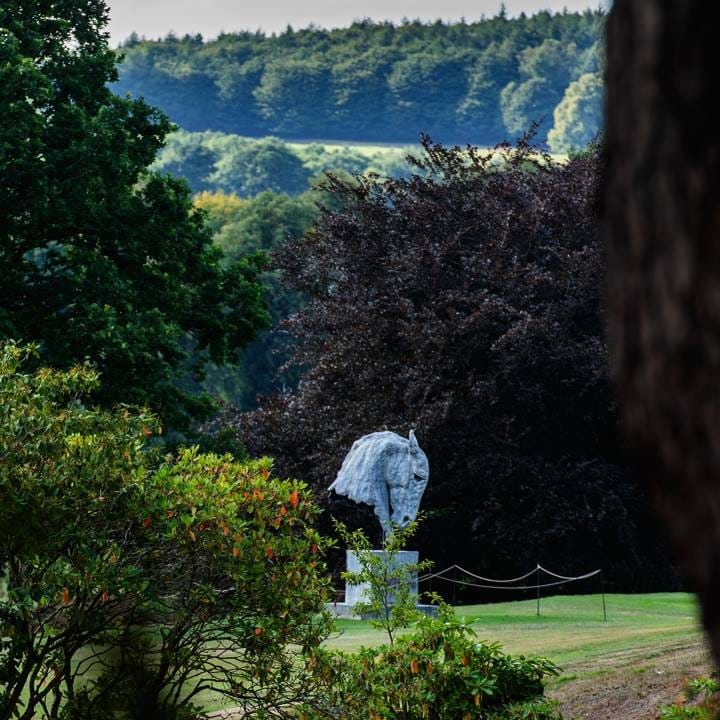 The horse at the south end of the Canal Pond reflects the strong connections between the family, estate and horses. The Rockery uses natural forms in an unnatural layout. 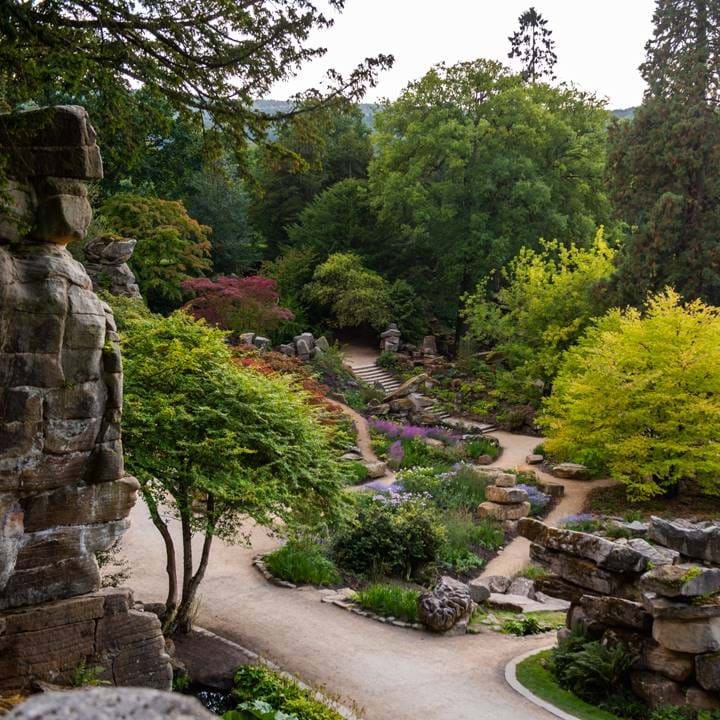 Inspired by the Alps and the Strid at Bolton Abbey, the Rockery was originally created with machinery and by design. A playground, a souvenir for the 6th Duke. 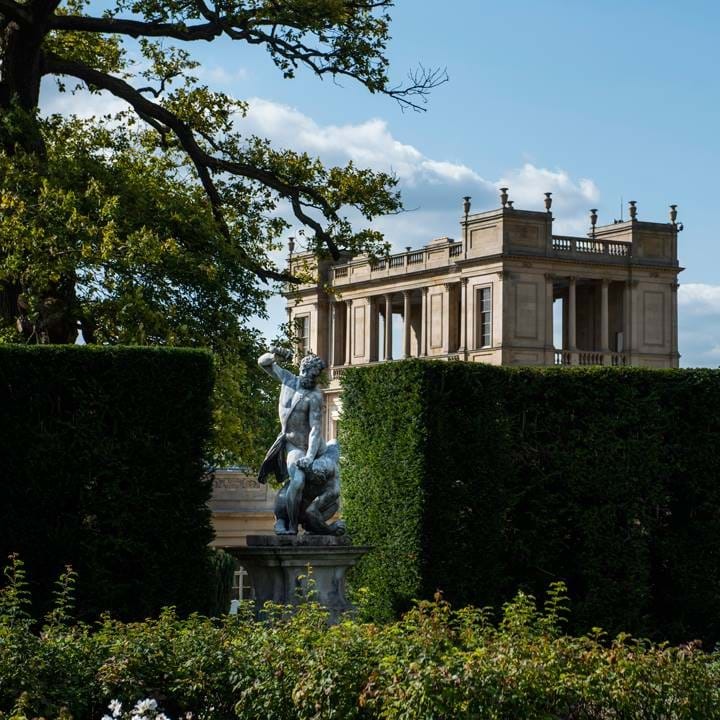 It has recently been expanded and replanted by garden designer, Tom Stuart-Smith: a new intervention in this complex space. Learning to be I by Antony Gormley stands below the top of the Rockery. Nearby, the Ring Pond, one of several ponds that survive from the 1st Duke’s garden, boasts a lead duck fountain from 1693. 12 herms from the 1700s stand on ceremony around the pond and along the footpath. Look for more sculptures among the rocks and boulders when you visit the Rockery. 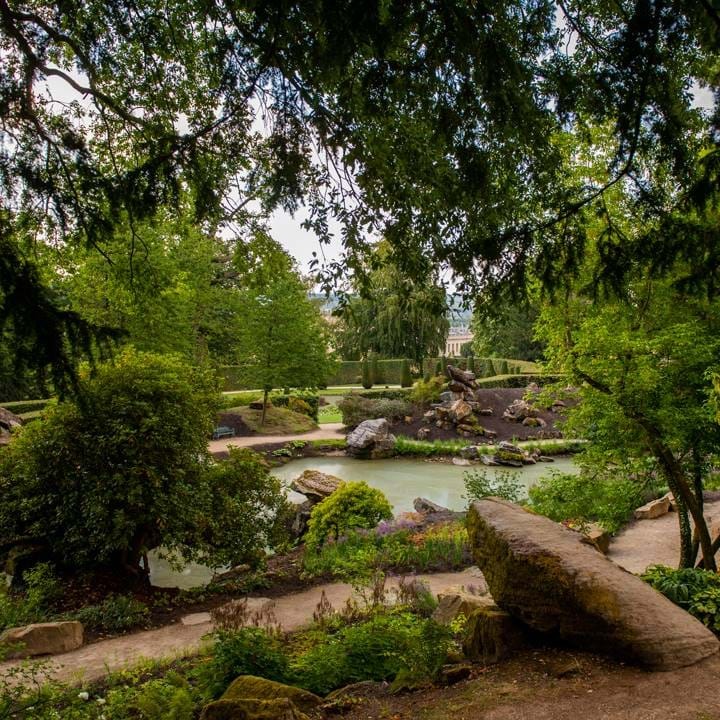 Explore the path from the Ring Pond north to the Rockery through the video below. The Ravine, which sinks downhill from the east, was planted by Duchess Evelyn as a wild space. The boundary wall tracing a line between the wilderness garden and wilder landscape beyond. It appears tamer now, planted with trees and shrubs, the path meandering across the stream. What do you think Tribute I, the bronze head to the east is about? 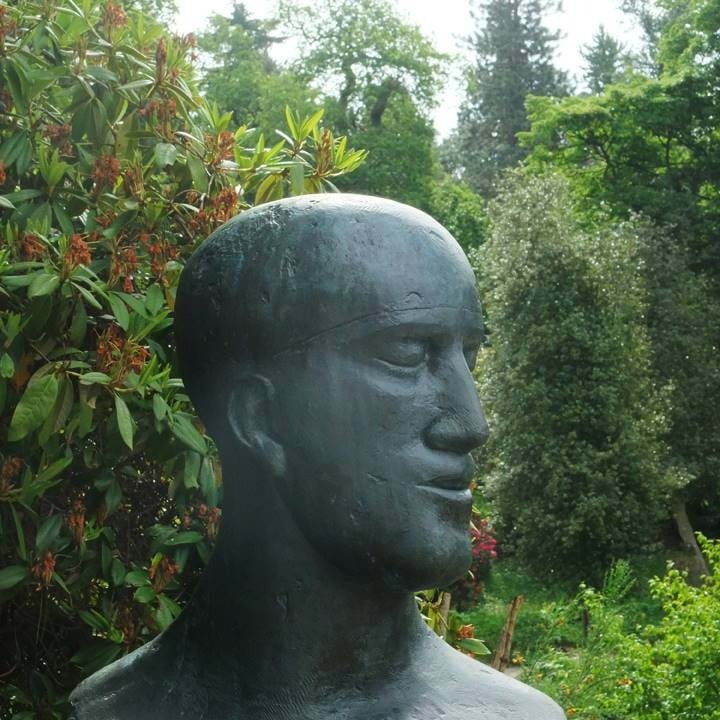 The artist, Elisabeth Frink constantly returned to key themes throughout her life, such as the horror and heroism of war, compassion, tolerance and spiritual strength. Look for the picnic down below the Ravine, the enlarged party, with figures 4 metres high in letterbox red. Déjeuner sur l’Herbe (the lunch on the grass) is a modern interpretation of a 19th century Impressionist painting by Édouard Manet. The Grotto Pond stretches north. 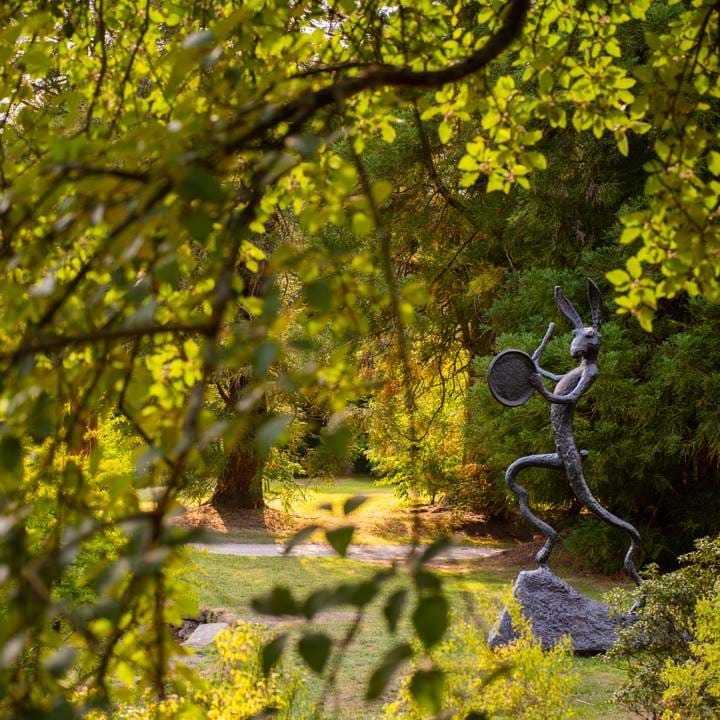 Behind you, the height and heavy presence of the Pinetum wraps the space. 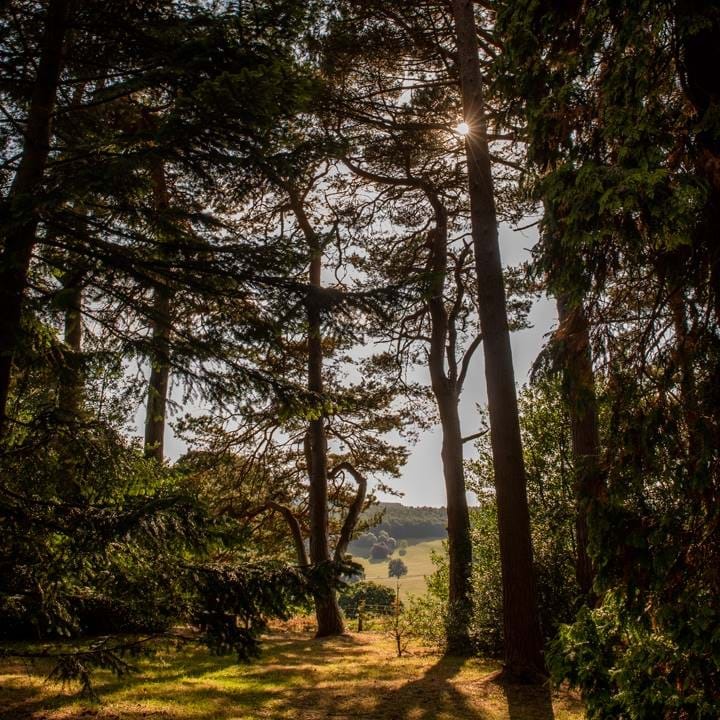 A collection of trees gathered in the early 19th century by the 6th Duke, this area of the garden has special markers at the entrance. A glimpse of Wrapt may be caught through the trees, a still solid against the float and flow of the leaves and branches. Michael Craig-Martin’s High Heel is placed to the south. The north of the Grotto Pond features Barry Flanagan’s The Drummer. Craig-Martin is a teacher, fostering and encouraging future talent. Flanagan was described as an ‘unworldly, bohemian figure’. He once went in search of the Loch Ness monster. To the east, the Grotto stands above the water. The lower building was created in the 1790s for Duchess Georgiana ‘Empress of Fashion’. It was lined with copper crystals to honour her love of minerals. Explore parts of the Grotto Pond through the video below. 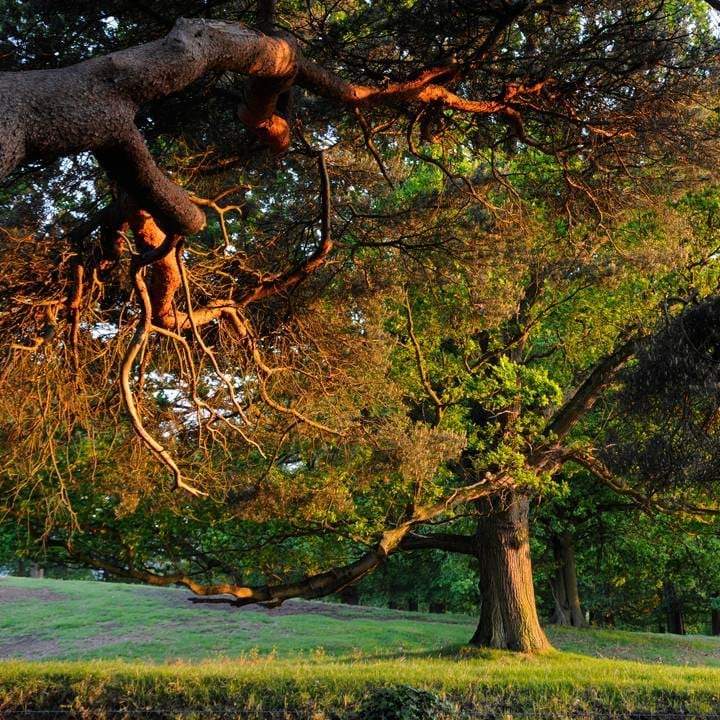 The trees are a mere 180 years old having been collected by the 6th Duke and his head gardener Joseph Paxton. Most of these species had never been seen in the UK before. To the south the garden rolls away into the Old Park. A Site of Special Scientific Interest the Old Park contains 500 year-old trees, rare creatures and fungi. Grazed by deer and sheep, visitors can gaze over but not enter this protected land. To the north, blackened shapes rise among the trees. 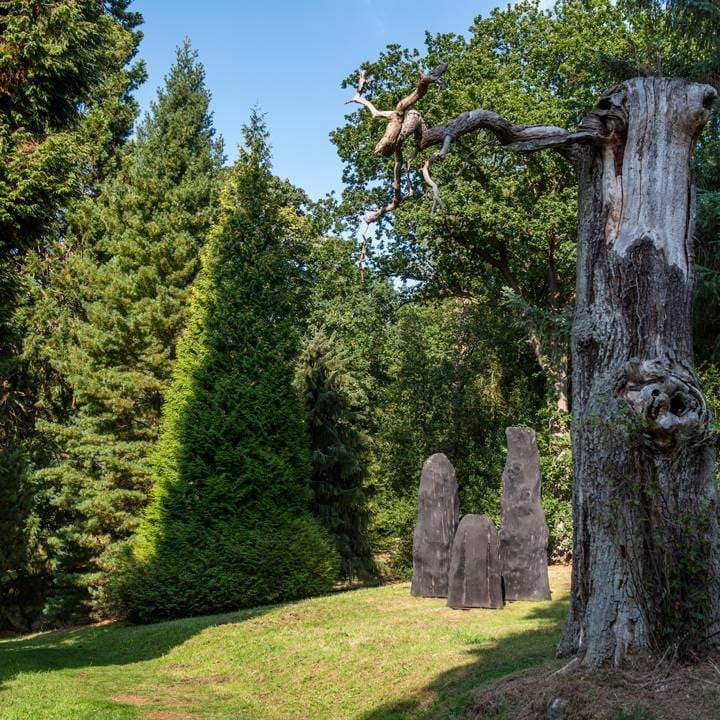 David Nash carved and charred two fallen oaks from the Sussex Downs to make Forms that Grow in the Night. The oaks were brought to the Pinetum in 2009 where they were charred again. 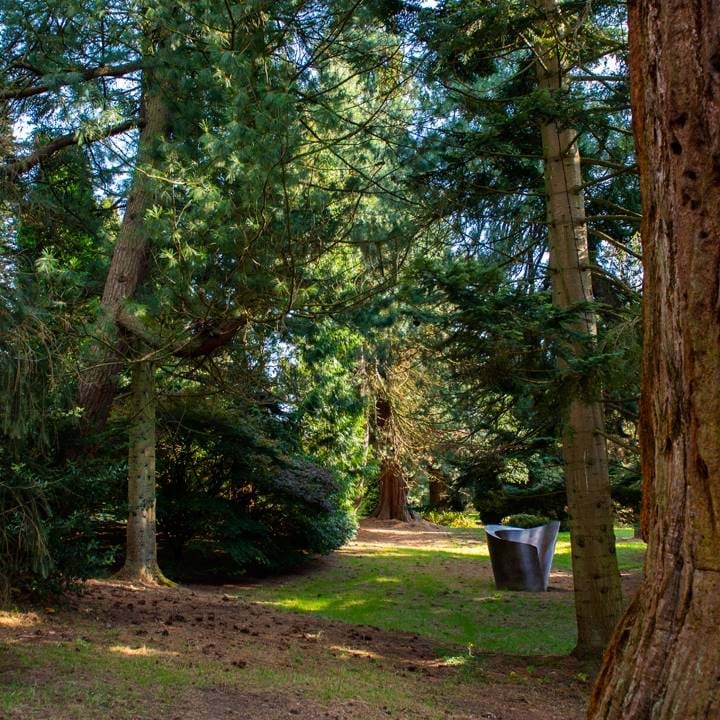 Explore parts of the Pinetum through the video below. 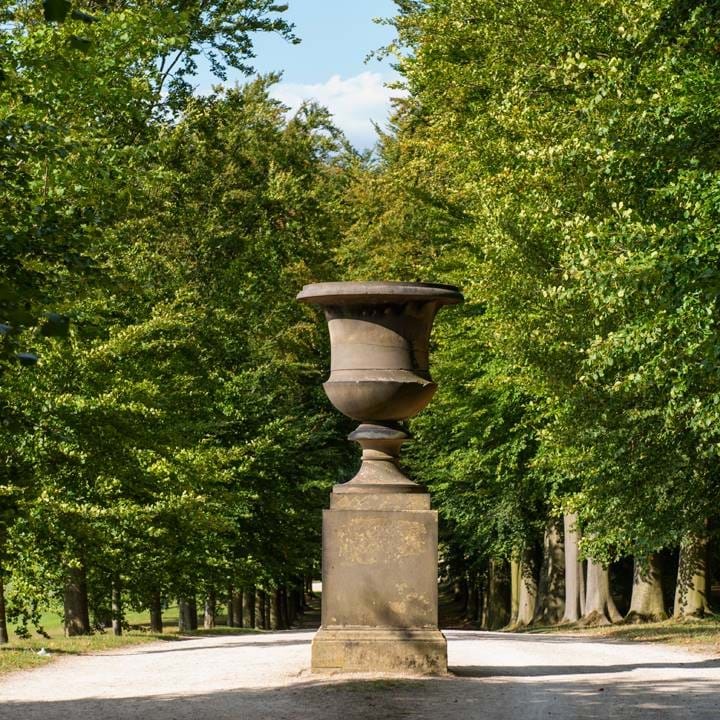 Columns topped with ball finials, sandstone busts and marble sculptures create walkways through the rose beds. Stony figures stare down from the roof of the greenhouse. The columns and busts were formerly part of the house, removed when corridors replaced colonnades. 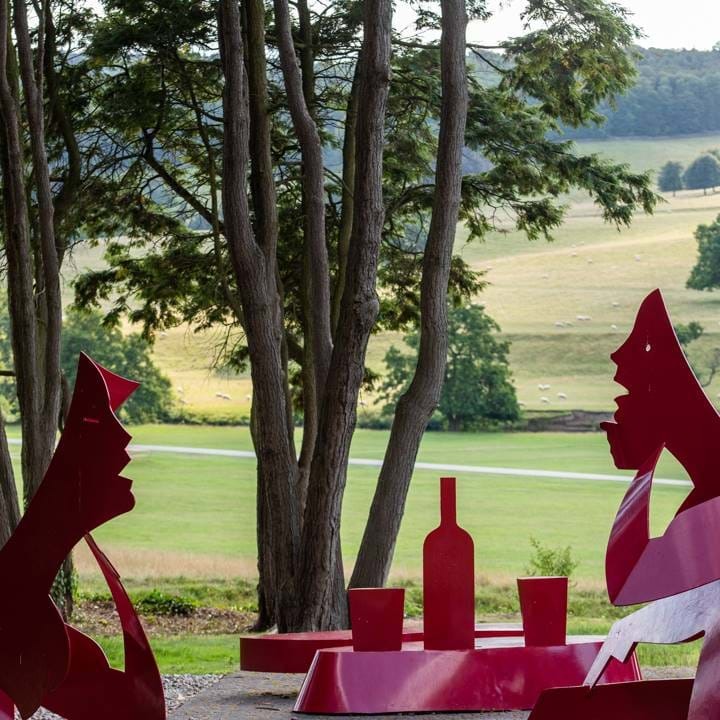 The bronze Figure of a Man by William Turnbull has been moved to replace a damaged column, it now stands between lead statues of Samson (west) and Pan (east). 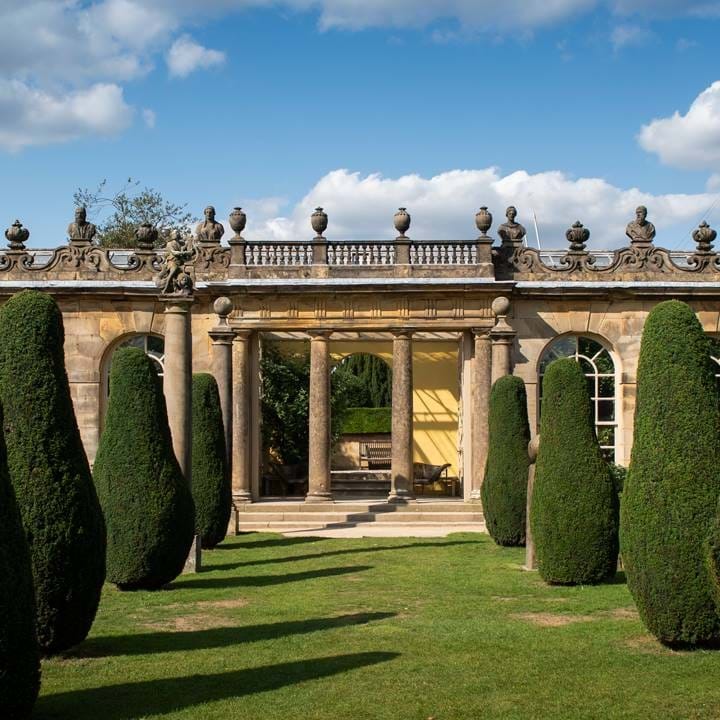 These came from Chiswick House, to Devonshire House in London, and finally to Chatsworth. Explore the Rose Garden through the video below. 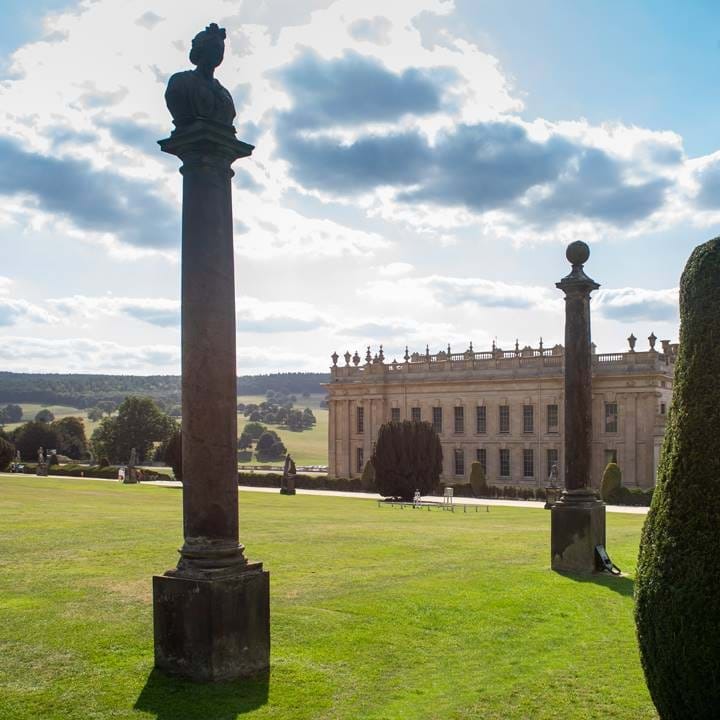 Our experts will guide young visitors around the exhibition - a fun and child-friendly way to explore the link created between the landscape and sculpture during Chatsworth Outdoors and a perfect half-term activity. 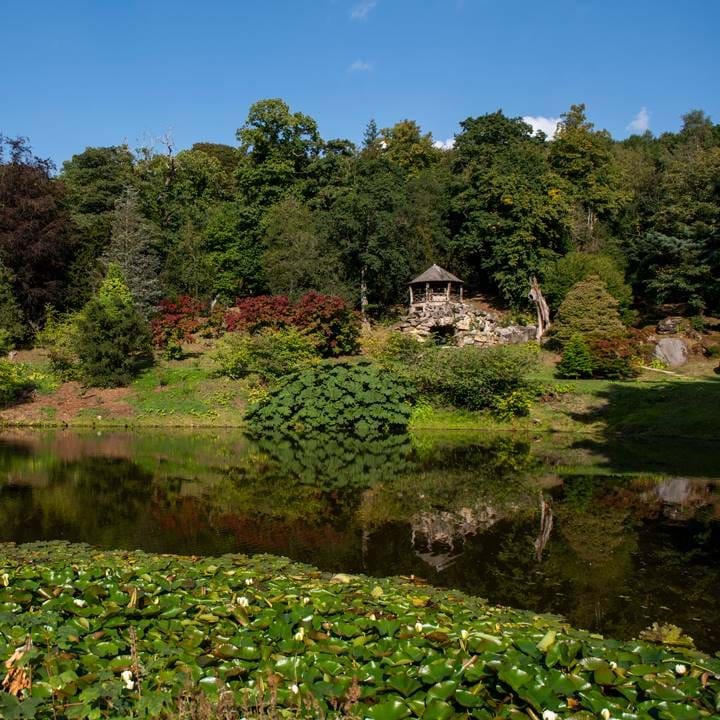 This experience includes entry to the Chatsworth Garden plus a drink and cake from Flora's Temple tea shop. The tour will begin at the top garden gate.